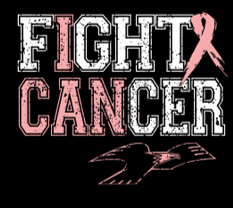 October Is Breast Cancer Awareness Month Help raise awareness by purchasing 'FIGHT CANCER' apparel HERE. Get your orders in by WEDNESDAY, SEPTEMBER 26th. Apparel will be delivered to school October 3rd. Students will be permitted to wear the shirts with their uniform bottoms October 4th & 19th. Students and fans are asked to wear their apparel Thursday, Oct. 4th to the LCC Volleyball game and Oct. 19th to the LCC Football game.